Looking for simple, healthy and kid-friendly snacks to make ahead for the week? 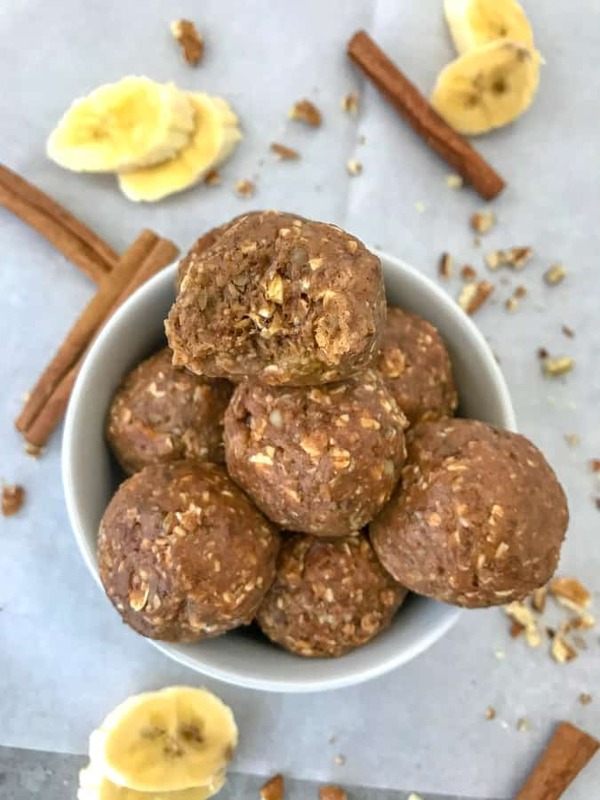 Then try these 3 No-Bake Oatmeal Energy Bites! Each made with oats and nut butter, they make for a great grab-n-go snack that you can enjoy without the guilt. Guaranteed to please your sweet tooth and tips on how to make your own so that your taste buds will never grow bored. If you’re here, you’ve got a sweet tooth. Am I right? Looking for something to kick that sweet tooth monster to the curb without indulging in your favorite candy bar, brownie or cake? Then try these bites! All three are very easy to make, coming together in the food processor in 10 minutes. They are a great healthy option to make ahead, whether for breakfast on-the-go, as an after school snack, or a treat to accompany your meal prepped lunch! 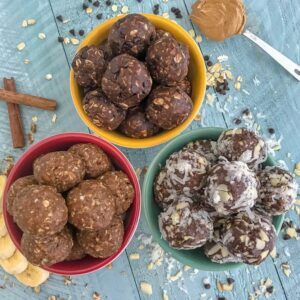 These bite ideas came about after getting so much feedback on Instagram over my Healthy No-Bake Peanut Butter Protein Bites! The excitement from everyone had me floored! Also, I can’t lie – I started making these balls to also use up some items in my pantry. Do you ever go on a baking streak and then out of nowhere you are sugared out and no longer in the mood to bake? That’s what happened to me. Bake, bake, bake and then crashed. HA. I think it was due to the holidays being in full force and needing so many ingredients for recipes to take to get togethers and family functions – I was stockpiled. Therefore, it was a great day to clean out the pantry! So if you have any items that sound delicious to you that need pulled out of the pantry and used — get them! 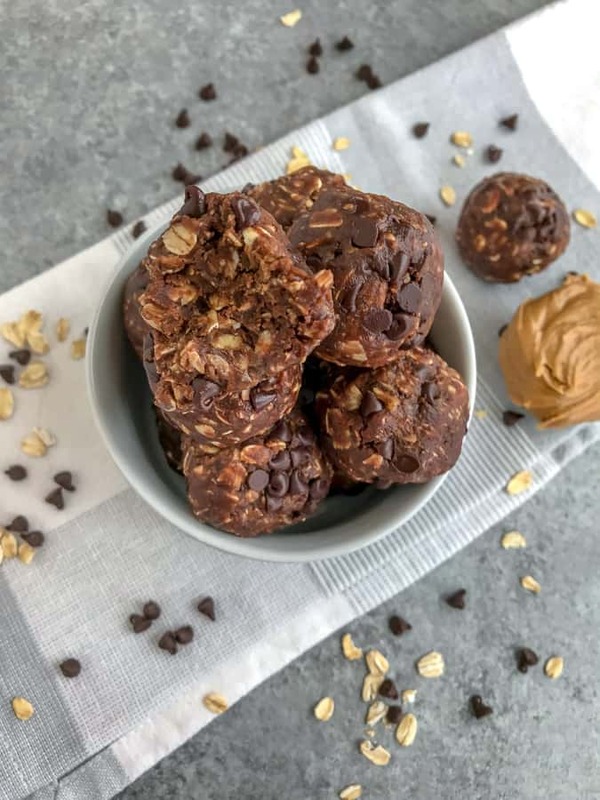 The options are endless to what you can put into protein bites like these. Seeds – chia, sunflower, etc. Anything you would put into trail mix! Filled with oats, almond butter, pecans, and the perfect banana bread seasoning. If you’re a banana bread lover, then you will adore these bites! Great served with a cup of coffee in the morning as you’re headed out the door. One of my absolute favorites! Chocolate + peanut butter come together in a perfectly blended and delicious concoction. These are a constant remake in this house. Filled with cocoa powder, chocolate chips, oatmeal, and peanut butter. This is a sweet tooth’s dream. A snack I don’t have to share with my husband! YAY! 🙂 Filled with delicious coconut flakes, cocoa powder, oatmeal, and the perfect amount of almond flavoring. Chocolatey, crunchy goodness. 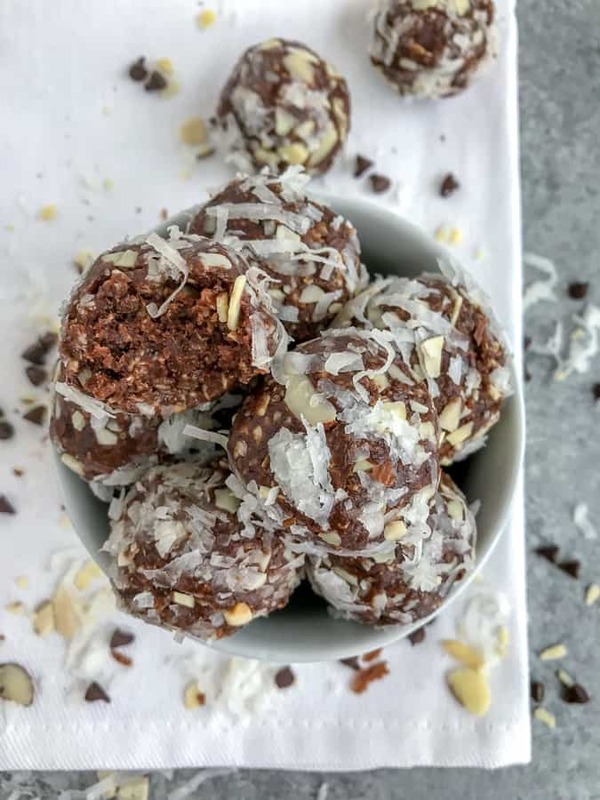 If you love Almond Joy candy bars, you will certainly enjoy these bites! Use a cookie scoop to portion control and roll these bites. It’s so much easier and less messy than a spoon. Trust me! If the mixture appears to be too dry, simply add more honey/maple syrup or nut butter. Sometimes adding 1-2 tablespoons of water helps, too! If the mixture appears to be too wet, add 1-2 tablespoons of oatmeal at a time until it thickens up. Not a fan of the nut butter listed? Swap it out for the nut butter of your choosing. When not indulging it is best to keep these bites stored in the refrigerator or freezer in an airtight container. They will keep in the fridge for up to 1 week and in the freezer for up to 1 month. Use parchment paper to divide the bites if stacking in a small container. This will help prevent them from sticking together as they sit. The mixture may require some time to chill (thicken up) in the fridge prior to rolling. I recommend 15-20 minutes or so. CRAVING MORE SWEETS? TRY THESE RECIPES! 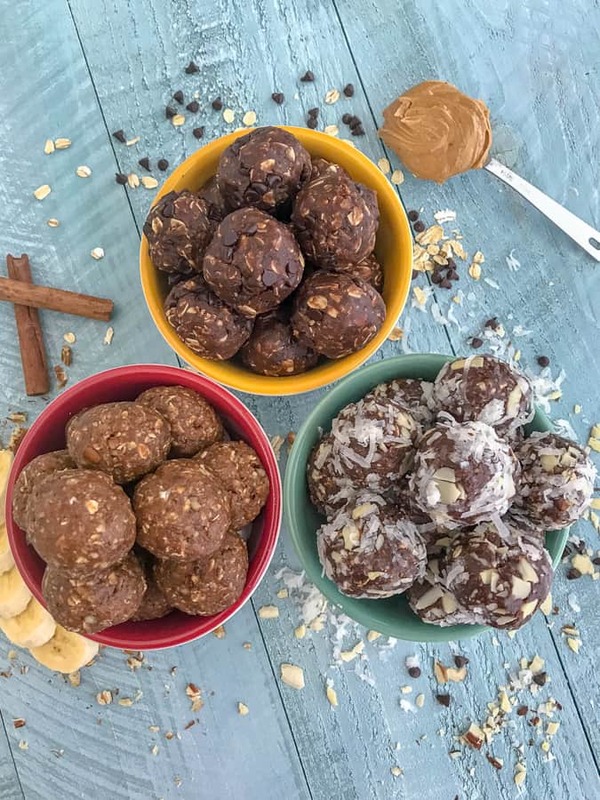 These three no-bake bite recipes are perfect for an easy, healthy, and delicious snack. Make these to curb your cravings, for an after school snack, or for a post-workout treat! Combine all ingredients, minus the sliced almonds and 1/4 cup coconut flakes, into a food processor and process until thoroughly mixed and thickened. 2-3 minutes. Layer 1/4 cup sliced almonds (crushed) and 1/4 cup of unsweetened coconut flakes onto a plate. Roll or press each ball into the mixture and re-roll, if needed. *NUTRITION IS CALCULATED FOR THE BANANA BREAD BITES ONLY. 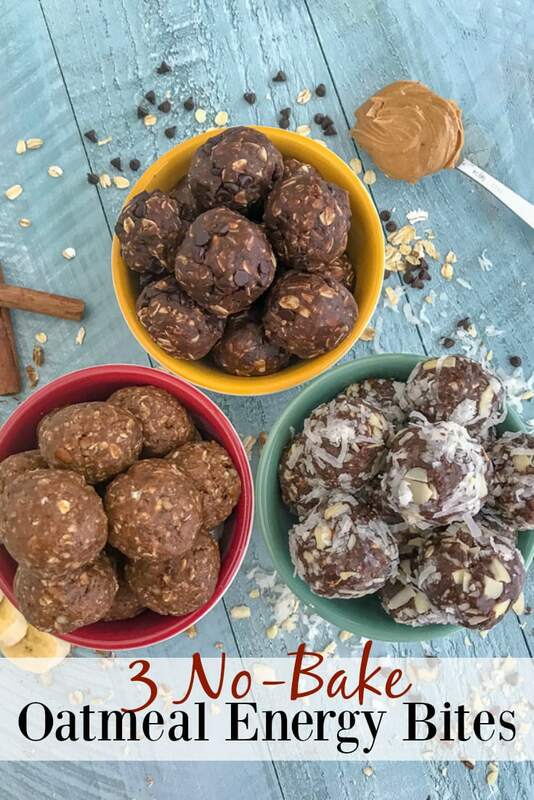 Please see other posts for the No-Bake Double Chocolate Peanut Butter Bites and the No-Bake Almond Joy Bites for full nutrition! Use a cookie scoop to portion control and roll these bites. It's so much easier and less messy than a spoon. Trust me!